Hair straightener owners assemble! Your time has finally arrived because this year has been the year of the short and sleek bob. 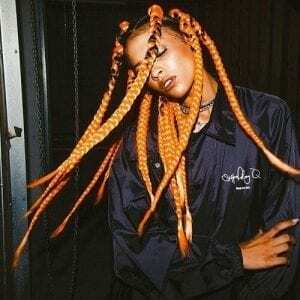 Curls are out, and straight hair is in as the end of the 2010s takes a cue from the 90s. 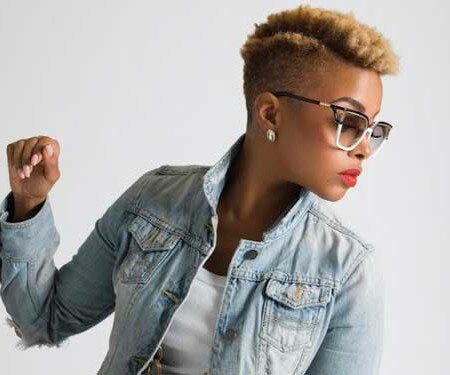 Take a look at the list of short straight hairstyles we have prepared, and see for yourself! Let’s start with a super simple but effective haircut. 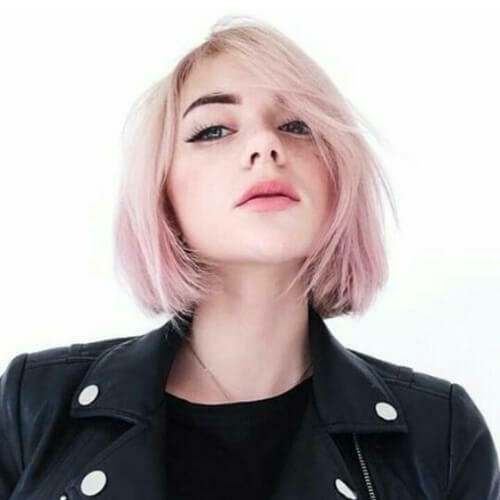 This bob has been the haircut of the year, which is why you’ve seen celebrities everywhere wearing it. Hurry up and get one before the trend wears off! We are inclined to believe that this is JLaw’s best look to date. 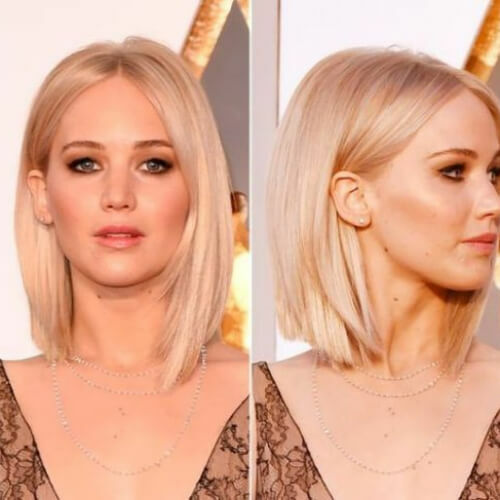 This choppy, platinum, slightly volumized short bob that barely reaches her shoulders made her look like a sophisticated diva on the red carpet. Here’s the exact same look on a brunette girl, as worn by Sandra Bullock many years before Jennifer Lawrence even dreamed of it. This goes to show that every style will eventually come back if you wait around long enough. Actress Emma Stone is no stranger to short straight hairstyles either. But, did you know that she actually has naturally blonde hair? Even so, the actress loves to dye it red because she thinks she looks better that way. Zendaya has curly hair in real life but doesn’t shy away from short straight hairstyles. 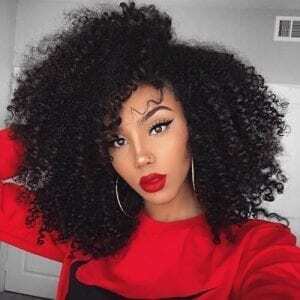 To achieve this look, she either straightens her hair out, or she uses wigs, of which she is a huge fan. She looks great either way. As we all know, Rihanna is yet another celebrity who has curly hair but decides to ditch it from time to time and go for short straight hairstyles. As most pop stars do, Rihanna has to reinvent herself as well to stay current. Most fans were shocked when they found out that the Mother of Dragons doesn’t have long, curly, platinum white hair. In real life, actress Emilia Clarke likes short straight hairstyles and has brown hair. Are you curious to know what the latest trends are? Then look no further than singer Bebe Rexha. 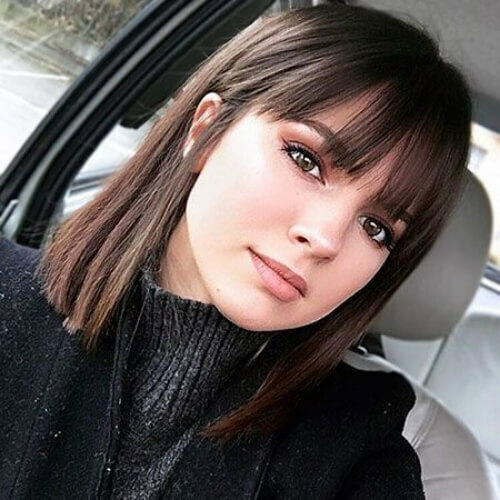 Her burgundy makeup perfectly complements her choppy, deeply parted white bob. When she’s not busy fighting bad guys with Thor in Asgard, Jamie Alexander takes red carpets by storm and flaunts her short pixie cut which absolutely everyone loves. It’s shaggy and sweet and makes her look great. Sooner or later, all pop stars go for the cut. 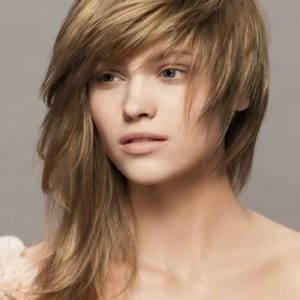 They start with long tresses when they are very young but then chop it all off into a stylish bob or an edgy pixie cut. Most of these choices are short straight hairstyles. Actress Lucy Hale opted for a sleek look taken to the extreme. Her glossy tresses have been parted down the middle and dyed with the blackest of blacks to give her than chic goth look she loves so much. This loveable comedy queen of Modern Family has been playing around with that shade of bronde for years. It perfectly matches her hazel eyes as well as her tanned skin, which is why she’s kept it for so long. Yes, frizzy is a style now that you can wear with confidence instead of something that will make you run to the mirror desperately searching for some hairspray or leave in conditioner. What a time to be alive! Naomi Watts’ angled bob is a superb choice in itself, but it may be a little too much for her. While the haircut is gorgeous per se, it just seems to be wearing her instead of the actress supporting the haircut. Instagram model Hailey Baldwin went for a 90s bob with the ends turned in. It is supposed to sweeten up her highly angular and square face and make her look more feminine at the same time. When it comes to short straight hairstyles, Jessica Chastain loves an asymmetrical, angular bob. She paired the rest of her hair with a summer berry lipstick and very little eye makeup so as to balance everything out. Here’s a throwback picture of Salma Hayek that really proves she was a bombshell in the 90s. We love the curtain bob with a middle part as well as the Kate Moss spaghetti strap dress. Not to mention the brown smoky eye makeup. 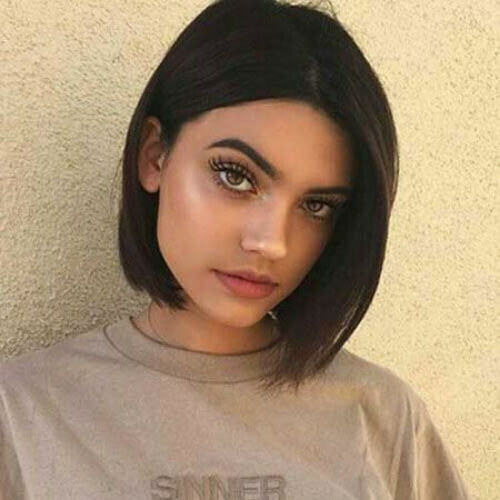 Of course, Kylie Jenner jumped on the latest trends and got herself a short and slick bob. Hers reaches far below the shoulders in a choppy and rough way. She’s wearing her signature matte makeup with lots of contouring. She has been named one of the most beautiful actresses in Hollywood history and just looking at her picture can easily tell you why. The vanilla blond highlights her blue eyes and is perfectly complemented by the ruby earrings and lipstick. You can never go wrong with a straight bob. It works well in every season, be it summer when you have to keep cool or the cold seasons when you have to wear a scarf. This is a perfect choice. 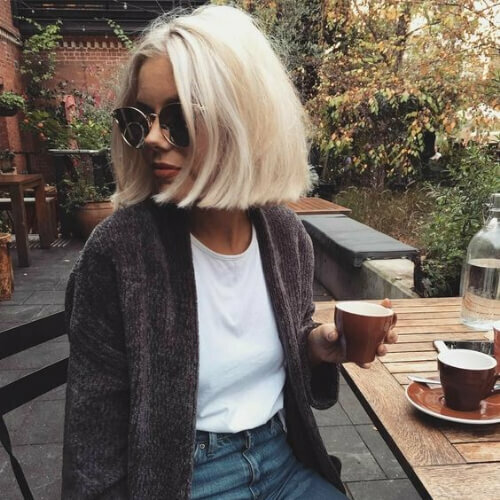 Actress Julianne Hough has such an amazing short pixie cut that even when she’s off-duty she still looks amazing with the smallest of efforts. All she has to do is add a little hair wax to her locks and style them. Speaking of pixie cuts, here’s what a platinum pixie looks like up close. Use dark makeup such as burgundy and shades of gray to add some color and depth to the whiteness of your hair. Your look needs it. This metallic green color is absolutely to die for. It’s another hot trend of the year which consisted of non-traditional colors. If you can make them metallic, that’s even better because metallic shades are all the rage right now. The pastels were the main deal of the season a few years ago. However, even if they took a step back from center stage, that doesn’t mean they disappeared completely or that you can’t still wear them. This is what happens when non-natural colors meet natural ones. 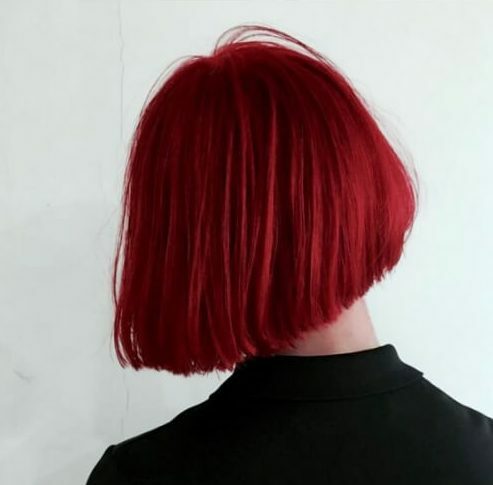 You get a vibrant shade of red hair that exists in nature, just not when it comes to hair. 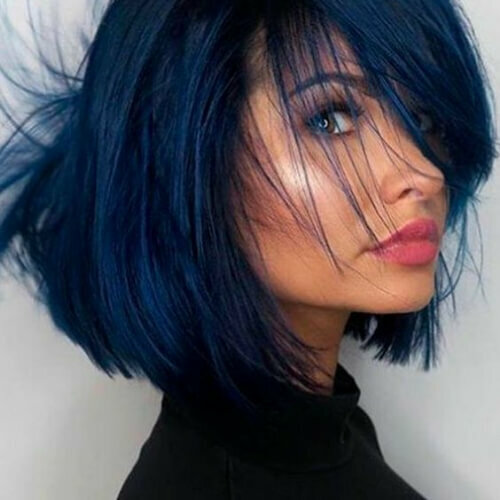 But it looks absolutely fantastic, especially on a bob. Who would have known that purple and peach could come together to make such an interesting combination? They are not two colors one would think of pairing, yet here they are making a case for themselves. Another wonderfully weird combination is that between purple and marker yellow. Both are very strong shades, and together they end up looking like spring has come to your hair. Try a makeup in complimenting colors. Here’s a color that you can wear both in the summer time and winter time. This rich and luscious dark blue is the perfect addition to any outfit for any of these two seasons, making you look luxurious and sophisticated. 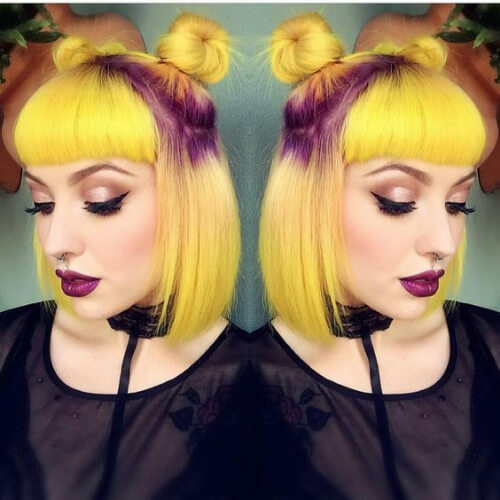 We couldn’t decide what we love more about this look – the color or the hairstyle. 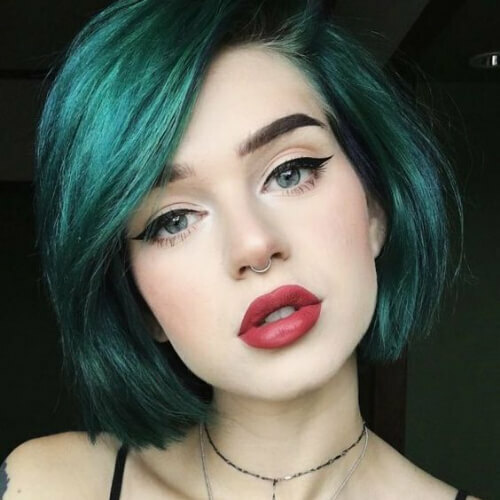 The color is mint green with dark roots, and the hairstyle is a classic 90s half up half down which all high school girls used to wear. We’ve seen peach before in this article in combination with purple. Now let’s take a look at this magnificent shade on its own. 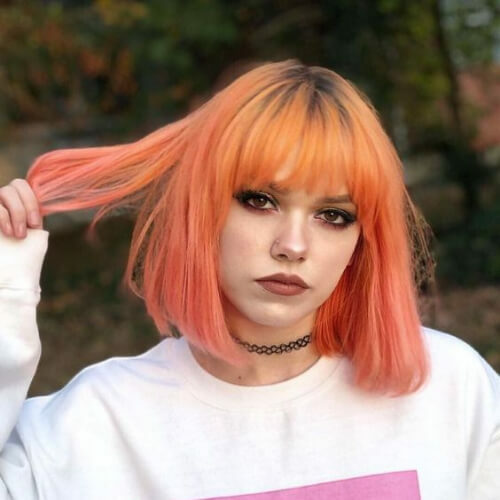 Peach is a combination of pink and orange with just a dash of rose gold thrown in there. 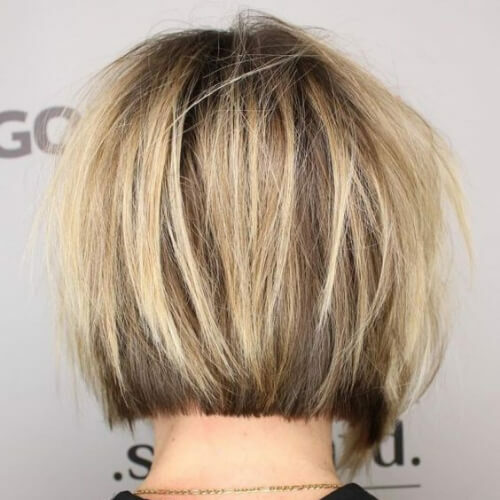 Leave it to this actress to make such a difficult haircut look effortless. This look is not easy to pull off because of the striking red and copper color and the very blunt cut with bangs, but Amanda makes it work. Tangerine is a member of the orange family. You can combine it with some pink or even red if you want to soften it a bit and take the edge off it. Make sure you can wear tangerine with your skin tone. Another shade that might prove tricky to wear if not styled correctly is this classic gray. It’s what we would call cement gray, a very solid color that has not been tampered with or mixed with other shades. 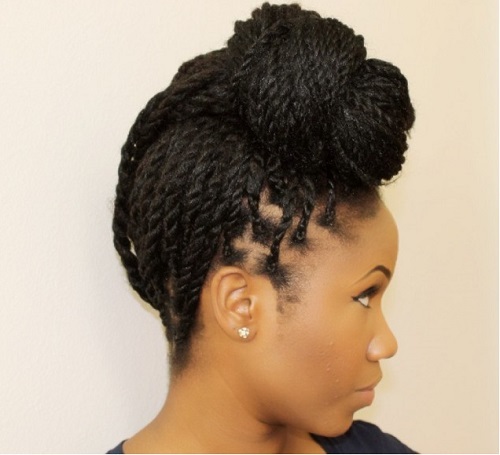 Deep side parts are a fantastic way to give some extra body to your hairstyle. Use some hairspray to keep your locks in place or some sea salt spray if you want to give it a bit of texture and crunch. The wet look has been in for a while now and, honestly, we cannot get enough of it. This is not a look one can wear to the office or in school. It belongs on the red carpet, but we are living for it right now. 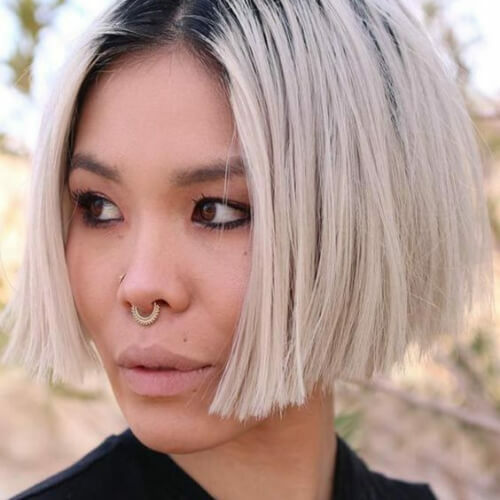 This might just be the most perfectly styled bob we’ve ever seen. 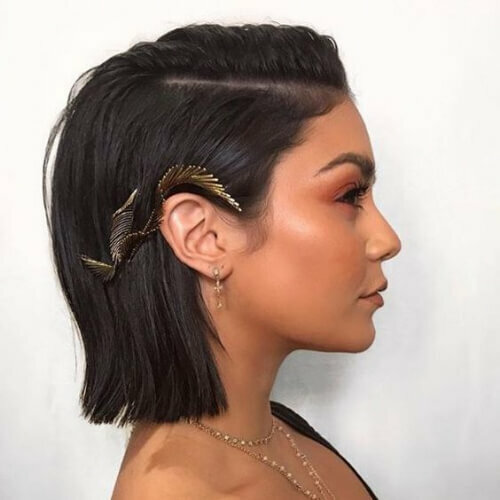 The haircut in itself is very simple and straightforward, so the stylist chose to put a massive metallic bobby pin on one side that looks like the wings of a dragon. Stylists always say that the perfect length for bangs is when they reach that exact spot between your eyelids and your eyebrows. Try to keep that in mind the next time you go to get your haircut. This is definitely a look. 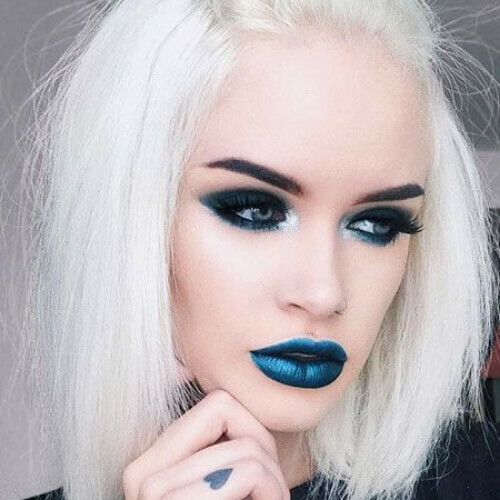 White hair, strong, black eyebrows, theatrical dark navy makeup, and metallic blue lipstick. Not to mention the extra white foundation and lack of almost any kind of contouring. 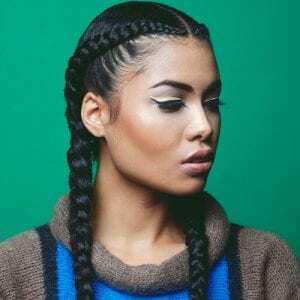 How cool is this half up half down hairstyle with a top knot and a set of wispy bangs? Wear some large earrings to complete the looks and give you that 90s vibe we all crave so much right now. Not everyone can pull off a chin-length bob. Therefore, you need to check with your stylist before you get this haircut. Find out if you have the type of face that will make this haircut look good no matter what. We’ve talked a lot about the 90s and their influence in this piece. Let’s see a haircut from the 2000s now. This is a layered bob from back then when you were considered the coolest girl around if you looked like this. We’re surely glad Jennifer Aniston didn’t stick with ‘the Rachel’ for the long run. It wasn’t a flattering haircut and the actress herself admitted years later to have hated it the entire time she had to wear it. This is a haircut for the ages. If you can pull off this wet and almost boyish look, you can pull off anything after that. Try the no makeup challenge as well, while you’re at it, to see how it makes you feel. This was a very rare sight, but it happened. Actress Anne Hathaway chopped off all her hair and then dyed it blonde. It may not be the best look for her since she’s so pale, though. The makeup choices didn’t help either in this case. 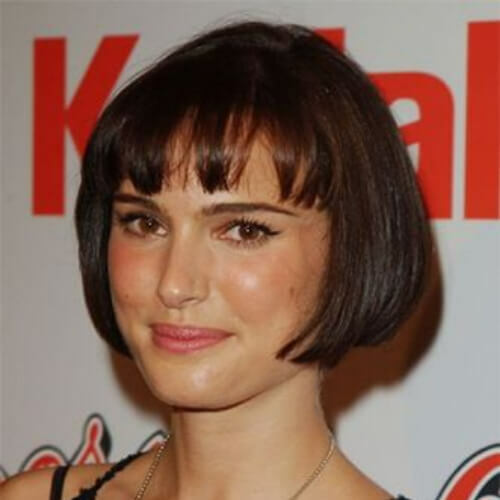 Here’s an older picture of Natalie Portman sporting a 1920s short bob. She also has a pair of blunt baby bangs that really tie in the whole look and make it seem as if she’s a flapper girl from the Jazz Age. 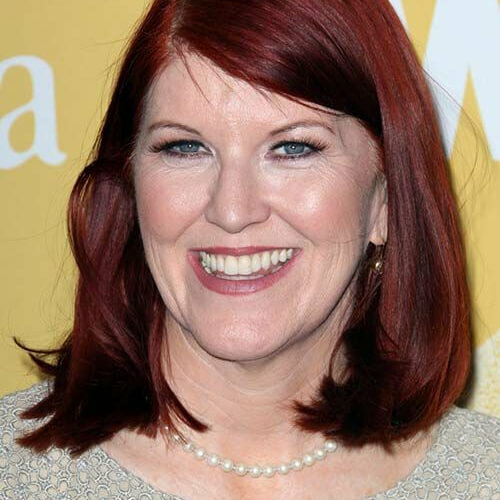 Actress Kate Flannery has been wearing the same haircut since we were introduced to her in The Office. 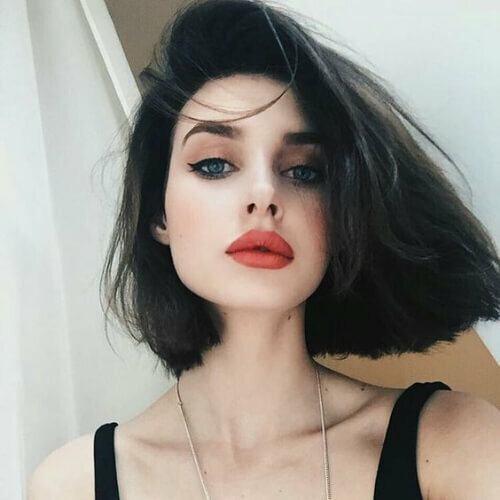 She wears a long and casual bob in a very striking shade of red that bounces beautifully off her blue eyes. 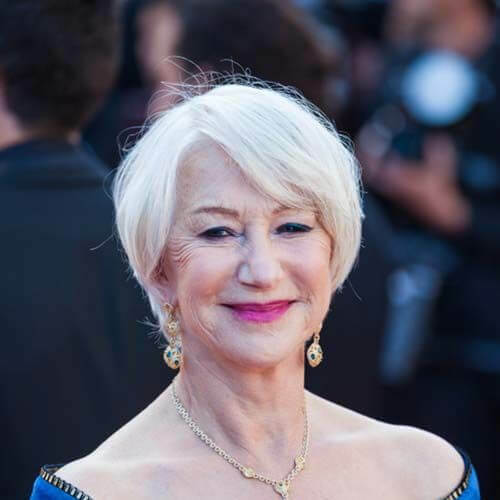 Dame Helen Mirren has embraced her golden years on the silver screen with a lot of grace. 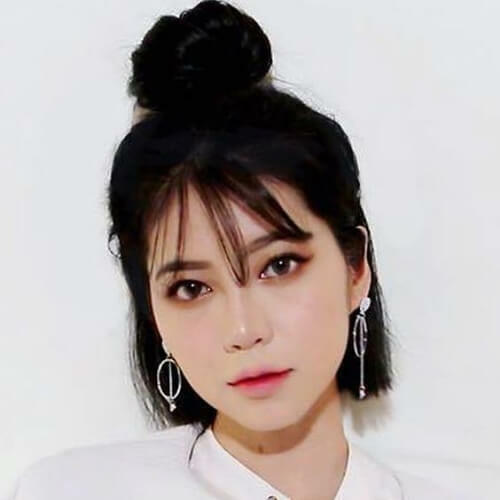 She wears a long pixie cut in an almost natural white platinum which she compliments with strong makeup and luxurious jewelry. 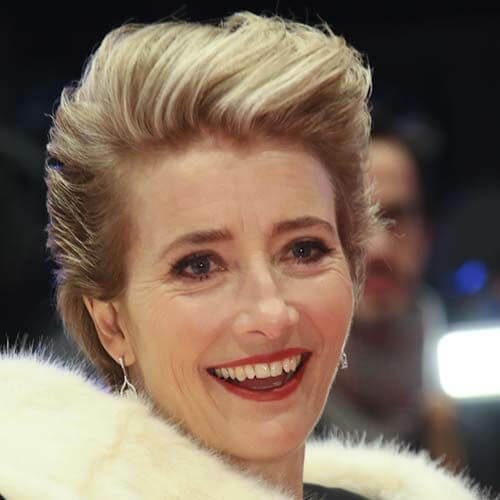 It’s difficult to look at Emma Thompson and not crown her as the queen of pixie cuts. She has had so much fun with this haircut that she has become a real inspiration to us all and especially to women over 50. Scarlet Johansson decided to chop off her long, blonde hair a long time ago. 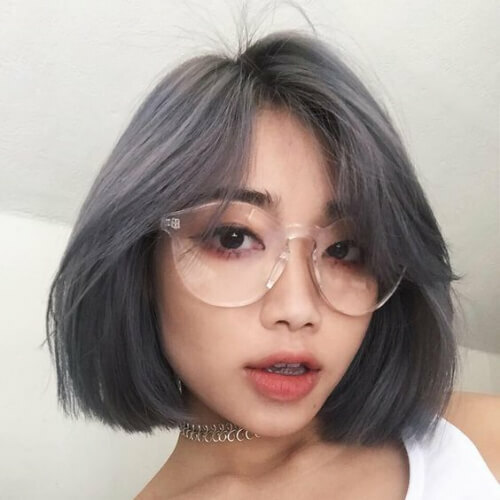 She kept the blonde and, instead, went for an edgy pixie that makes her look a little more badass than she used to be. This is a very interesting color which sits at the intersection between blonde, platinum, gray, and beige. It will work wonders for you if you have blue or green eyes. Therefore, give it a go as soon as possible! 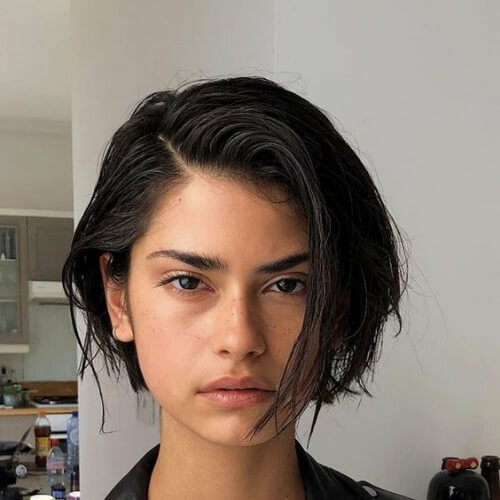 When it comes to short straight hairstyles, they may seem simple enough. However, the reality is that you need to find one that compliments your facial type. Talk to your stylists and work out together the best solution for you. In the meantime, let us know in the comment section below which one of these ideas inspired you the most!